We stay at comfortable three and four-star hotels, Pousadas and Paradors. One night is in an old monastery that has been converted to a 4 star hotel. All have old-world atmosphere yet have modern comforts. All rooms in the hotels we use have a private bathroom. .
Porto - We stay at the four star Hotel Carris Porto Ribiera. Located in the old quarter of Porto, overlooking the river Douro, the Carrís Porto Ribeira is very close to Ribeira Square. Air conditioned rooms have mini-bar, safe, TV. 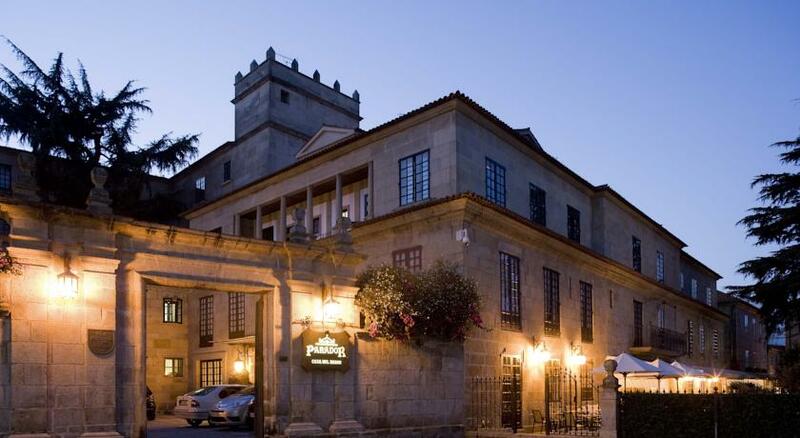 Braga - In Braga we stay at the 4 star Braga Mercure Centro situated within Braga’s historic area and surrounded by museums and a pedestrian zone. Rooms are spacious with TV and free wifi. There is a swimming pool on the roof. Viana do Castelo - Located on a hill above the town, the historic Pousada Viana do Castelo is surrounded by green gardens and woods. There is a magnificent view of the city and over the delta of the Lima River and a large expanse of golden sand beaches bathed by an ocean of intense blue. Air conditioned rooms have a private bathroom including bathrobe and amenities, safe, a mini bar and TV.. There is a lovely outdoor swimming pool. Valenca - We stay at the Pousada de Valenca. This Pousada is in the small town of Valença which, throughout history, was the last Portuguese stronghold before the Spanish border. The hotel is located within Valença's fort which was originally built in the 13th century to defend the town against the Spanish on the other side of the Minho River. There is a stunning view of the river and of Tui, on the opposite side. Air conditioned rooms have TV and mini-bar. A swimming pool, terrace and bar await tired walkers at the end of the day. Baiona - The Parador at Baiona is one of the most unique Spanish Paradors. 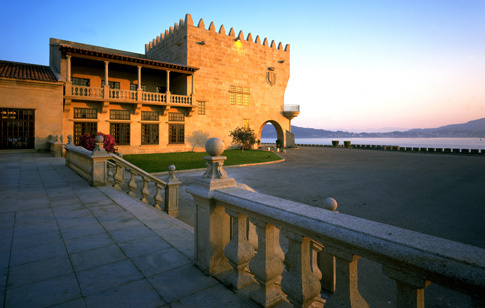 The building is part medieval fortress and part seigniorial Galicia mansion. It commands an impressive site above the ocean within a walled enclosure and has a beautiful pine forest on either side. There is an inviting swimming pool. Air conditioned rooms have TV, mini-bar, safe. 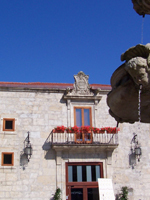 Caldas de Rei - Our private coach takes us 20 minutes off the Camino to the Pazo o Rial. This is a lovely castle converted to a 4 star hotel. In a location of outstanding natural beauty, the hotel has a swimming pool and is just a short walk to the beach. Air conditioned rooms have private bath, TV. WIFI is available in the public areas. 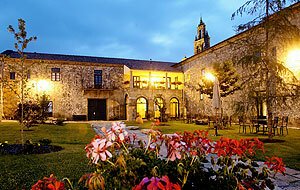 Padron - Pazo de Lestrove is our final accommodation before reaching Santiago. A "pazo" meant a country estate of the Spanish nobility and usually consisted of a stately manor house or castle surrounded by gardens and outbuildings such as a chapel. This pazo was once the country escape for the Bishops of Santiago.. Today is is an atmospheric country hotel complete with swimming pool. Air conditioned rooms have private bathroom, TV, minibar. Santiago - In Santiago we stay at the Virxe de Cerca, is an 18th century former Jesuit residence located in the old quarter near the Cathedral. It is an atmospheric, four-star hotel that still has the stone walls of its historic past but now is a comfortable hotel surrounding a garden courtyard. Rooms are equipped with hairdryer, safe, satellite TV, minibar, phone and air conditioning. Meals: Breakfast is always included (usually a buffet). 4 picnic lunches are provided. On other days we stop in villages where there are small restaurants or shops where you can purchase lunch. All dinners are included and allow everyone to sample regional cuisine which changes along the route. The food is excellent and plentiful and many of the hotels include local wine with dinner. Vegetarians can be accommodated.